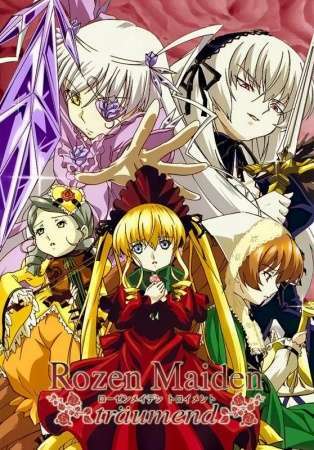 As the story of Rozen Maiden closes, a new chapter begins in Rozen Maiden: Träumend. Shinku and the other sentient dolls of the Rozen Maiden collection are living life as usual at Jun Sakurada's house. Having settled into his role as Shinku's partner in the deadly Alice Game, Jun overcomes his former fears and prepares to return to school. And although Shinku and the other dolls idly pass the days by in the comfort of Jun's home, dark times lie ahead as a new foe presents herself: Barasuishou, the seventh Rozen Maiden. But Barasuishou is a mystery even to her sisters, none of whom have ever laid eyes on her until now. Shinku considers this a sign that the Alice Game is coming to an end, meaning the dolls will soon be forced to fight one another. Haunted by the upcoming battle and nightmares concerning another doll, Shinku begins distancing herself from the others. If she wishes to claim victory, it will come at a high cost—the lives of her sisters.